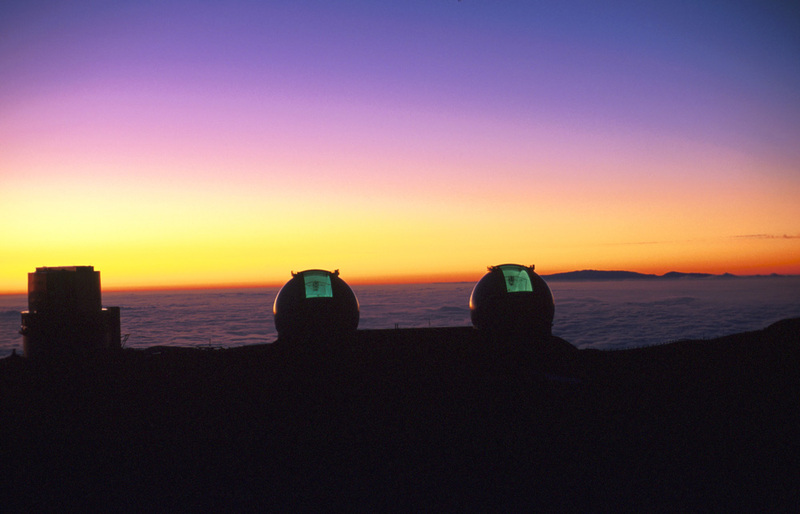 The Keck interferometer on Mauna Kea, Hawaii. The interferometer consists of two telescopes each with a 10 meter reflecting mirror, made up of 36 hexagonal mirrors on computer controlled actuators for pinpoint accuracy (4 nano-meters), in separate domes, about 279 feet (85 meters) apart. Photo Credit: W. M. Keck Observatory. Note the observing shutters have been opened and are facing east, so when the first objects to be observed come up over the horizon, the telescopes will be able to track them immediately. Interferometry has two great observing advantages. First, using two telescopes twice the amount of light coming from the object is captured. Second, just like having two eyes, each image is that tiny bit from a different perspective, giving the telescopes a kind of stereo vision and that allows for the computer processing the image to add in a great more detail. The observatory to the left of the two Kecks is the Subaru 8.2 meter optical/infrared telescope operated by Japan. For more photos of the Kecks and their observing gallery, click here. Photos Courtesy of the W.M. Keck Observatory.